The private sector is increasingly acknowledging the significant role that their investment decisions and internal controls can play in reducing modern slavery risks in their activities. Less evident is how this can be achieved. The CDC, DFID, EBRD and IFC recognised that additional guidance was necessary to increase the private sector’s ability to identify and assess modern slavery risks and to implement appropriate controls and solutions. 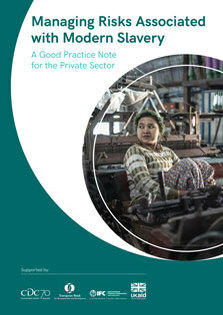 This Good Practice Note, commissioned by these institutions and prepared by the Ethical Trading Initiative (ETI), serves as a comprehensive resource for investors and companies. It does not set new standards but aims to provide practical tools to support environmental and social due diligence, as well as monitoring processes that many investors and companies already have in place. It also aims to provide an understanding of why action is necessary, how to manage and address issues, and the need for cooperation with others.